Createspace Independent Publishing Platform, 9781505615111, 234pp. 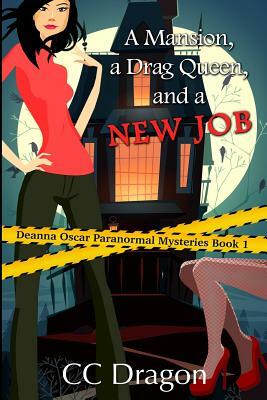 Psychic medium Deanna Oscar wants to be a normal psychology professor at a nice college. The universe has other ideas. When the grandmother she never knew dies and leaves her everything, Deanna enters a different world. In New Orleans anything goes and her psychic powers aren't a secret. She doesn't plan on staying but a psychic vision puts her on the trail of a killer. Deanna can't turn her back on the future victims and becomes immersed in her grandmother's world. She isn't sure how to manage the mansion and fortune she inherited or the people who came with it. An ex-priest, a Latina drag queen and a socialite beauty queen are the living entourage. Add in a houseful of ghosts and haunted objects and Deanna needs a little help. In over her head, she struggles to catch a killer who is out to get her as well. A loyal Chicago girl who loves deep dish pizza, the Cubs, and The Lake! CC Dragon is fascinated by the metaphysical and paranormal. Loves creating characters, especially amateur sleuths who solve mysteries. Coffee and chocolate addict who loves fast cars. Still look for a hero who likes to cook and clean...so she can write more!